I have already previously posted Tourneboeuf's photograph of Versailles and will refer to his uninhabited public libraries. When you look at some of his prints, you enter the hushed stillness of symmetrical beauty. You begin to consider the unreadable volumes on the dusty shelves. 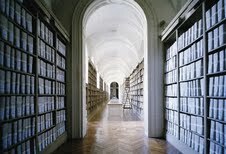 If you add some characters, the library begins to rustle with intimate activity. The schoolgirls in Nazif Topcuoglu are not studious. They are lolitas skipping class, gossiping over thick volumes and peering at photography books. The above image is if you would put a dandy on display in a similar library, I suppose a room amongst many others in a mansion. 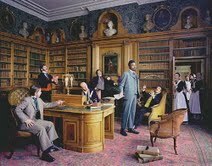 Yani Shonibare has received much applause for this photograph which has been compared to Hogarth at an exhibit that has received high honors at the Louvre. You can see maids, men wearing tweeds and the artist himself, the only African in the photo. In this photograph by Mitra Tabrizian, a group of individuals, solo or in clusters, with Iran in the backdrop, pose while conducting their separate daily activities. There is a market shopper, a taxi driver, women in full chador. They seem busy and could be real but they are actually actors. 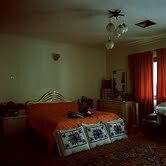 The first photograph I ever noticed by my preferred photographer Reza Aramesh is of an interior, similar to Lamya Gargash's, in its kitsh decor. 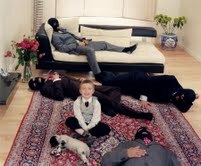 On the large Persian carpet are bank robbers, with their faces concealed in head masks. A boy holding the symbolic sacrificial lamb coexists with them, not far from a still life of fruits. A solitary figure on his own in a desolate landscape is also what I appreciate. Tarek Al Ghoneim produces many of those. Yet the photograph I prefer by him is the quintessential Arab male, in Kafiyeh, who takes long strides on the tarmac towards the airplane. I seek drama in photography: whether a mise en scene or a simple backdrop devoid of characters, or a large group of actors role playing for the photographer's lens. Photography as a precious art has gained momentum in the past two decades.I remember a friend in Switzerland telling me before I was on my way to the Basel Fair,that I should now look for Art Photography and even Video and DVD!That was alien to me,but 10 years later,it becames sought after avant garde art! In my family,we are avid photographers.One of my sons went to Kabul couple of years ago to capture photos of Afghan kids,happy to meet visitors,content with a pencil or a paper,walking in the bazar with their family etc.Photography is the art of capturing moments in real terms,it becomes art when it is set by artists in a framework.